We can all agree that in order get the job done right the first time, a dishwasher detergent needs to tackle tough jobs, be cost efficient, and should be easy to use. These were our top criteria when we selected our best dishwasher detergent. 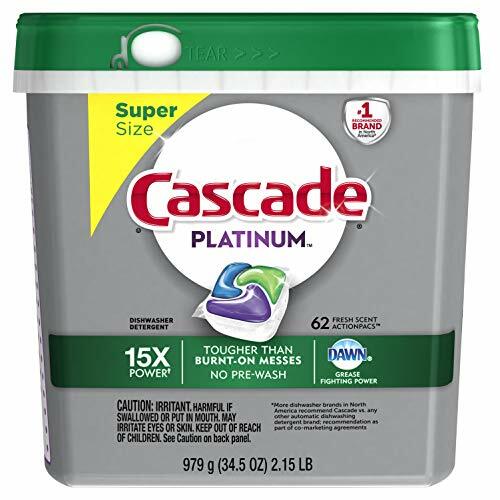 If you are ready to get loaded up and start washing, Cascade Platinum scored high marks in every category and is our top pick for sparkling clean dishes. One of the costs of a delicious, home-cooked meal is the pile of dirty dishes and pots that go along with it. The longer the dirty dishes sit, the harder it can be to get them clean – unless you have a strong, good-quality dishwasher detergent. With the large selection of choices on the market, deciding which one to use may seem like guesswork, but this is not true. There is a difference between dish washing detergents, and if you know what to look for, you can choose the one that will get your dishes sparkling clean while saving you time and money too. You will get more value every time you do the dishes when you use Cascade Platinum Actionpacs. There are 65 pods in this package, providing 65 loads of dishes that can be washed with one purchase. These platinum actionpacs have 15x more film-fighting power to get your dishes sparkling clean. These pacs have been formulated with Dawn which is a well-known grease fighter so your dishes come out grease-free and clean. Has 15x the power, eliminating annoying film that makes dishes look dirty. Cascade Platinum Actionpacs are available in many fresh scents and a choice of package sizes as well. Customers can subscribe to have these excellent dishwasher detergent pacs delivered right to their door and not have to worry about running out of them. These pacs from Cascade will scrub away food that has been stuck onto the dishes for 24-hours and you won’t need to pre-rinse. The all-in-one cleaning action will dissolve foods, fight any stains, and will deliver a brilliant shine you will be proud of. Each pac is formulated with the well-known Dawn grease fighter. These powerful cleaning pacs are available in Fresh Scent, Lemon and Citrus scents. You can choose from a variety of sizes as well. This is the #1-recommended brand that adds more value per dish washing load than the competition provides. 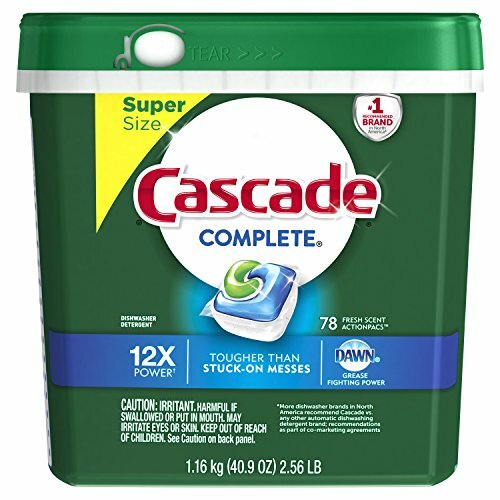 Just one Cascade pac is equal to using 6 pacs of some of the national bargain brands. Using this product will ensure that you never have to set the table only to find dishes with leftover dried food on them. The ingredients in the pacs dissolve baked-on as well as burnt-on foods, even from the corners and edges of your dishes. You won’t need to bother with additives because the Rinse-aid is right in the pac. 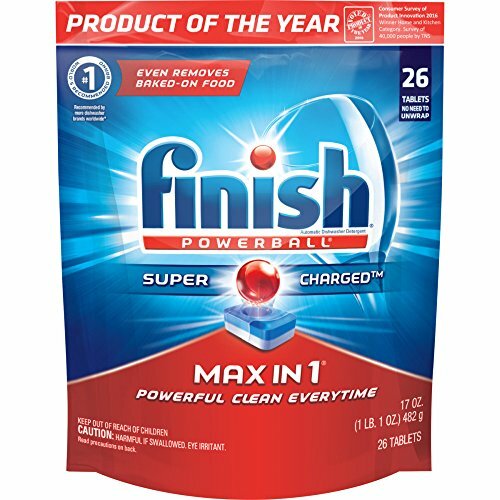 You will get an amazing clean and finish when you use Finish Powerball Dishwasher Detergent tabs to do your dishes each night. These tabs have 3x the concentrated cleaning power of the regular Finish powder and the results speak for themselves. This package has 90 Powerball dishwasher tablets that will provide you with 90 wash loads. The easy to use, pre-measured tablets have a wonderful clean, fresh scent. The Jet Dry rinse-aid gets rid of any spots and cloudiness for sparkling shine every time. The Pre-soaking Powerball will get rid of any food residue so the dishes come out super clean in only one wash. You will never have to re-wash the dishes when you use Finish Powerball Dishwasher Detergent which will save you time and money. Each tablet is individually wrapped and they are biodegradable and safe for all septic systems. All users need to do is unwrap one tablet and place it into the dispenser. If it doesn’t fit into the dispenser, check the manual to see what it recommends. All you will need is one tablet per wash load. The best temperature is between 125-140 degrees. The tablet will completely dissolve during the wash cycle. These powerful cleaners will remove tough coffee stains, baked on foods and more. One of the biggest complaints of using a dishwasher is the cloudy film and remnants of food that is left on the dishes after the wash cycle has finished. The quality of the dishwasher detergent you choose is what is responsible for these annoyances. Using a good quality dishwasher detergent will prevent your dishes from having to be rewashed. The top choices that we have featured above won out over other brands of dishwasher detergent based on results, performance, ease of use, scent, value and other factors as well. Customers will get the benefits of the tough cleaning power any of these choices above provide. Read our buyer’s guide below to learn even more about choosing the right dishwasher detergent so your dishes always come out sparkling, clean and grease free. What is a Dishwasher Detergent? Dishwasher detergent is cleaning liquid that is specifically for use in the dishwasher. Dishwasher detergent comes in many different forms so there are several methods you can choose from. Regardless of the detergent you choose if you scrape of the large leftovers from the dishwashers before loading them into the dishwasher the detergent will work better. You don’t need to pre-rinse the dishes in most cases, thanks to the powerful cleaning agents in the detergents. Not having to do this step will save you time and money. The chemicals in dishwasher detergent and hot water can be really bad for items like silver, fine glassware, bronze, brass, cast iron, gold colored flatware, hollow handle knives, pewter, tin, anything that is made of wood or utensils with wood handles, and disposable plastics. Avoid washing these items in the dishwasher so they don’t get ruined. Anything that has a lot of value to you should be washed by hand. There are many different types and brands of dishwasher detergent on the market. Before you choose one there are some things that you should think about so you make the right decision that will meet your needs. Gel Detergents – Gel dishwasher detergent has a consistency that is similar to regular dish liquid. It is thicker and more gel like and it comes in a bottle that you can squeeze to get the amount you want into the dispenser. Gel detergents are more concentrated than dish liquid and dissolve fast in water. You won’t have to worry about white residue ending up on the dishes because the detergent dissolves so fast. The drawback to gel detergents is that they dissolve too fast and can end up totally dissolved before the dishes are washed. Powder Detergents – Powdered dishwasher detergent is slower to dissolve and sticks around during the washing cycle longer. Powder detergent is not as popular as a choice due to the grit and white residue that can frequently end up on the dishes if the wash and rinse cycles are not long enough. Tablets and pods – This form of dishwasher detergent is the most popular. It is convenient and easy to pop one pac into the dispenser and that’s all there is to it. No spills, no mess, and no guessing how much to use. Depending on the tablet, it may contain a rinse-aid as part of the ingredients to help with ensuring that the dishes are super clean. White residue is still possible with these tablets or pods if the cycle is not long enough or the strength of the dishwasher is not that strong. Dishwasher detergents usually contain some kind of additional additives to the main cleaning ingredients. These additives are designed and added to the detergent to increase cleaning power and provide even better results. We’ve listed some of the more common and popular additives that are used. Bleach – Detergents that contain bleach additives are very effective in removing baked and burned on foods and are also better at removing tea and coffee stains. Enzymes – Enzymes that are added to detergents help break up the food into smaller particles that are easier to remove during the wash cycle. Rinse-Aids – This is a very popular additive that is added to many detergents. Rinse-aids help prevent spotting and the white film that ruins the look of washed dishes and makes them look like they need another wash. Rinse-aids are very good when hard water is present. There is a difference between phosphate based, chemical detergents and natural, plant based detergents. With the phosphate detergents, you will notice more occurrences of white residue being left due to short washing cycles. The issue with the natural based detergents is that they have been frequently found to be ineffective at getting the dishes cleaned, especially if they have not been pre-rinsed. What is the White Residue? While the white residue that shows up often on freshly washed dishes is annoying and unattractive, it is harmless. The culprit causing these white spots and cloudy finishes is hard water. Calcium that is present in the water will get distributed on the dishes during the drying portion of the cycle. If you’re having a problem with white residue being present on your dishes there are a few things that you can try. The tips below should help you resolve your white residue problem. See if the dishwasher detergent you are using has phosphates. If it does not, the white residue is from the lack of phosphates. They are responsible for bonding to the calcium deposits to help prevent hard water during the dishwashing cycle. Increase the length of your dishwashing cycle. This can also resolve the problem of hard water causing issues. Wash fewer dishes at a time. A crammed full dishwasher will not get the benefit of the dishwasher detergent as much as a lighter load will. There are a few other products that are used in dishwashers along with the detergent. These are sometimes included in with the dishwasher ingredients; others can be added as additions. There are three basic additional products that people use to help get their dishes as clean as possible. Dishwasher Cleaner – even if your dishwasher looks clean at first glance, grease and lime scale can build up in the places you don’t see including the filters, spray arms, pipes, water pump and the drains. Using a dishwasher cleaner on a regular basis according to the bottle instructions and needs of your dishwasher, all of the internal parts will remain clean as well. Rinse Aids – Rinse aids are added to the dishwasher and work during the rinse cycle to get rid of detergent and food residues. They can also help prevent that cloudiness that the glasses can get. The result of using rinse aids is t hat your dishes will be crystal clear and shiny. Fresheners – With use, you may notice that your dishwasher has developed an unpleasant odor. Fresheners will help get rid of that bad odor. You can also use a squeezed lemon half that you have put in the cutlery tray. Dishwashers can be a great way to wash dishes when they are combined with the right dishwasher detergent and the cycle is long enough to get the dishes really clean. With all of the choices in dishwasher detergent available, you can find the right one for your preferences. Choosing a good quality dishwasher detergent ensures that your dishes have that shiny, sparkling clean look that you want without having to wash the dishes multiple times. The information we’ve provided will help you make an informed decision that you will be pleased with and continue to use to get great results.